Add your own PO or reference number for the tracking of freight. When logging on and click the “Booking Entry” button you are presented with the following sections. To complete a booking simply fill out the form and press the “Submit Booking” button. Click on the image to see the full size. It’s important to select the correct customer number. This entry determines who paying for the freight to be moved. Your login id is linked to the customers you have previously been authorised to charge a booking to. If a customer isn’t on the list, contact Coastal Midwest and we can arrange the necessary authorisation to have additional customers added to your list. The simplest way to select a customer number is to press the [search] button and select them from the list. All non-priority bookings requiring a pickup after these times will be picked up the next business day. When selecting “Priority Booking” you are requesting Coastal Midwest Transport to either pickup or deliver freight outside the normal schedule or operating hours. You will need to acknowledge that you have the authorisation to accept the additional charges associated with the Priority Booking. If your booking is made from within the normal Coastal Midwest Transport schedule the freight will arrive as quickly as possible. 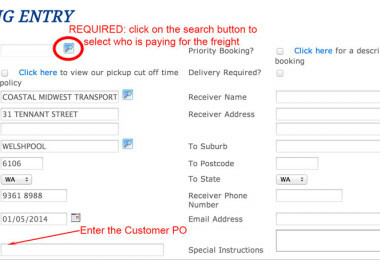 Priority bookings are only required if you need your freight picked up or delivered outside the normal schedule. The below information and our Where We Go page will assist in deciding on whether you require an priority booking. Entering extra information in the “Special Instructions Field will assist Coastal Midwest Staff in ensuring your freight arrives exactly when you need it. Coastal Midwest’s default product code is “GEN”. This is the default product code. 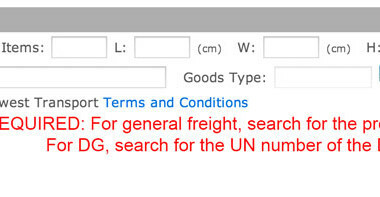 If the freight is classed as Dangerous Goods, you need to click the search button and search for the appropriate UN number as the product code. Complete the rest of the booking details fields. Note that all fields are mandatory. You can add upto 12 individual Booking lines for a single booking. Once a booking is submitted, you are presented options to print both the connote and Freight Labels as well as enter a new booking if you need to. 2 copies of the connote is printed on a single A4 piece of paper. There is no requirement for you to cut the connote, just simply sign the top and bottom connote and give to the driver. Both copies are required to travel with the freight. If you require a paper copy yourself, simply print an additional copy, or just look it up on the system using the Booking Search option. There will be a freight label produced for the total number of items on bookings. When there are multiple items on a booking, please pay close attention to the specific it as it is important to attach the correct freight label to the correct freight. This is especially true for bookings with Dangerous Goods. If you require Coastal Midwest to pickup the freight you need to check the “Pickup Required?” option. If you require Coastal Midwest to deliver the freight beyond its depot you need to check the “Delivery Required?” option. Booking freight at Coastal Midwest Transport has never been so quick and easy. Monitor your freight for all. Our dedicated team is here to help with any questions you may have. Fill in the form below and we will get back to you very soon.